We went down to ICTLT 2016 which was held at Suntec City Singapore on 30th and 31st March 2016 to promote the Maker Faire and the Maker movement to the educator community through hands on activities. Soldering station: This station certainly was filled with unexpected surprises for us! Having much more reach than we had anticipated, many teachers thoroughly enjoyed this station and kept coming back over the two days to try it again. We had only brought down two soldering stations but from the looks of the queue, we should have brought a lot more! Soldering being a new skill for many gave the teachers(even those who were apprehensive at first and didn’t want to try it) a chance to handle a soldering iron to solder a simple circuit. Many teachers went a step ahead to experiment with the PCB board( picture below) and the components to try out what other methods work besides the basic we showed them and came back many times over the course of the two days to try soldering again and again. Paper Circuits: We brought down circuit templates that guides the participants to creating a circuit of their own by starting off working on a simple circuit and building up from there. Using just 3 components-copper tape, batteries and LEDs, many things were created by the teachers on a piece of paper. We also brought along a handful of Makey Makey demonstrations. The teachers especially loved the piano and had fun playing around with the code. ICTLT also proved to be a wonderful platform for us to promote Maker Faire Singapore to over 500 educators. Many teachers expressed interest to bring in their students for the Faire and some had students with wonderful projects which could be showcased during the Faire. The response from the educators and the interest they displayed upon finding out about Maker Faire was wonderful. We would like to thank all the children and parents who took time off on a Saturday morning to join us for the Making Toys and Games Workshop held on 9th April 2016. Thtough this workshop, we aimed to promote parent and child bonding while at the same time allowing participants to engage in multiple hands-on activities teaching them about Science, Art and Technology. We were pleased to watch the parent-child bonding and how parents and kids brainstormed many ideas to make their projects better. Here are some of the activities that we put together for making toys and games, together with the support from the local maker community. 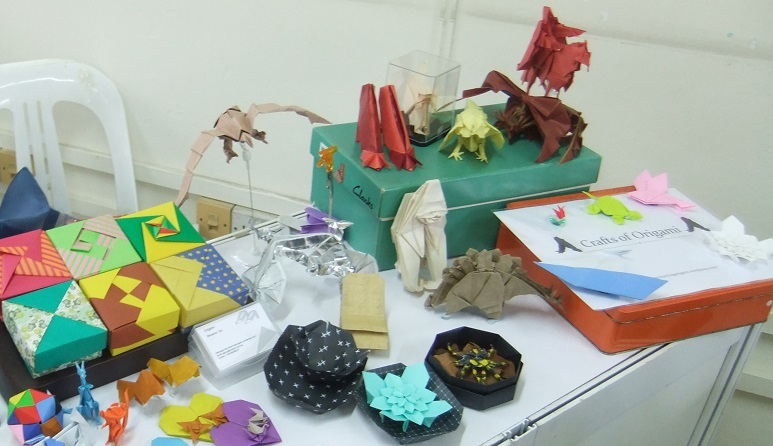 Origami: Origami is more than a simple art form. It has many commections with Maths and Science (check out foldscopes to find out how origami helped this Scientist make an incredibly low cost microscope). Community members from Crafts of Origami started the kids off in basic origami, with flapping birds and swimming fish. I was fascinated to see how the simple folds made the fish move. 3D Printing: We have heard of 3D printers and 3D pens, having seem them several times at Maker Faire. But for many of the children and parents, 3DPrintingHub.Asia‘s 3D doodler and pen was the first interaction with 3D printers. A large number of PLA glasses were made and broken. .
Clay art: Sze Sze used ceramic powder and Lego trays to create clay Lego figurines. It was really fun for the kids, hacking the lego figurines with paint and clay. We had families of little lego critters all over the room. If you want to make your own, go ahead and buy a box of ceramic powder and some lego ice cube trays. It will be worth the trouble and keeps the kids entertained for hours. Sewing Owls: Last time we tried sewing in a family workshop, it was not so successful and many of the participants didnt really want to sit and thread a needle. But this time, Gladys from Hangmade by Gladys brought along these really pretty owlets and no child could resist wanting one of them. The catch, learn to sew. Of course, this included threading a needle, learning to stuff and reasonably complicated skills. Many kids asked their dads to help and that was great! Electronics: Gabriel and Ibnur- who are both part of Ground Up Initiative(GUI)– shared quite a bit about electronics for kids. Ibnur engaged the children one on one by showing them how to wire a buzzer and use it to communicate in morse code. Balloon Powered Car: Niha started this station with a simple car powered with balloons. But the families took it in stride and made so many variations of the cars. A particular group of participants were very keen in making and improvising their car. We later learnt from them that a few families had come together and decided on a challenge amongst themselves where they will bring back the balloon powered car that they learnt to make during the workshop and work on it for the next two weeks to improvise it as much a possible. We hope that they will share the results of their challenge with us!